This is the dedicated page of the clubs and Nations teams kits news and release dates while the leaked pictures of the kits will also be placed here. 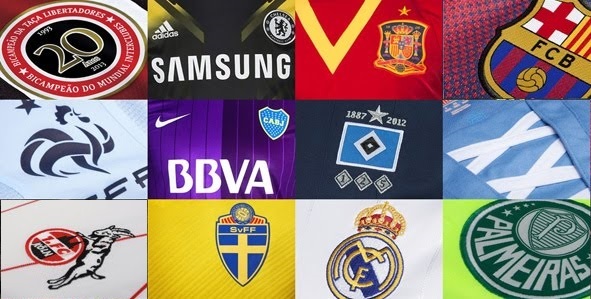 The links to the team kits will lead you to a specific team category shirts, they can be officialy released football shirts, leaked picutres of the shirts or rumoured kits. 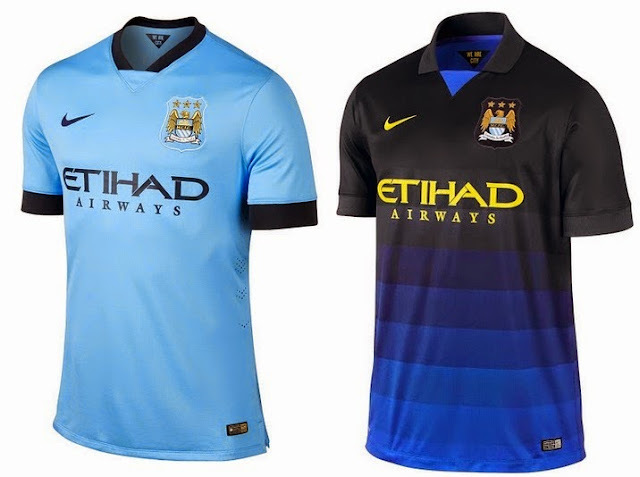 This is the new leaked image of man city home 2014-15 kit for the upcomign season. Nike produced a pretty much similar design to the last season. 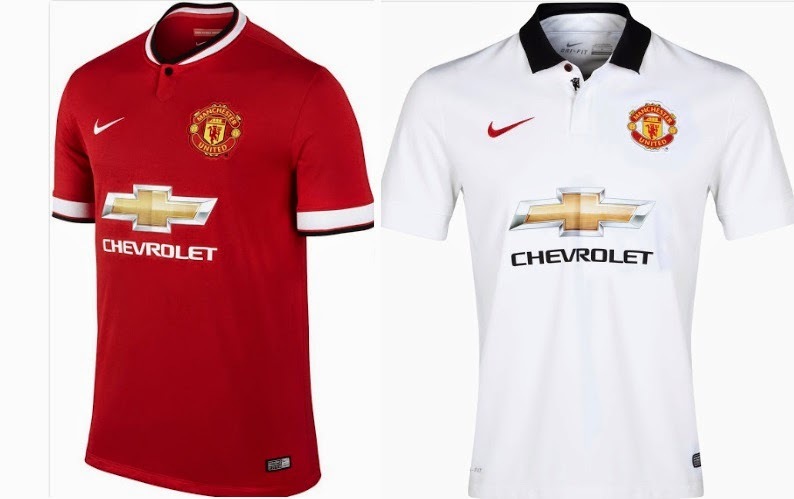 The new manchester united home kit for 2014-15 has been leaked and the new kit features new sponsor logo of “Chevrolet” while nike is the kit supplier. The official release of the kit is suppose to be in during pre season tour of USA. These are the new home and away arsenal 2014-15 kits designed by Puma, both kits will be released during the pre-season tour for arsenal. Below are the new home away and third kits for Juventus which they will be using in 2014-15 season. All three home away and third kits for Inter Milan has been leaked for upcoming season 2014-15. take a look at the shirts here. Following are the new leaked kits for Real Madrid home and away. The home kit gets a tradional white as main colour while new kit comes in with “henley collar” at the back of the kit we have pink and black stripe which is new. 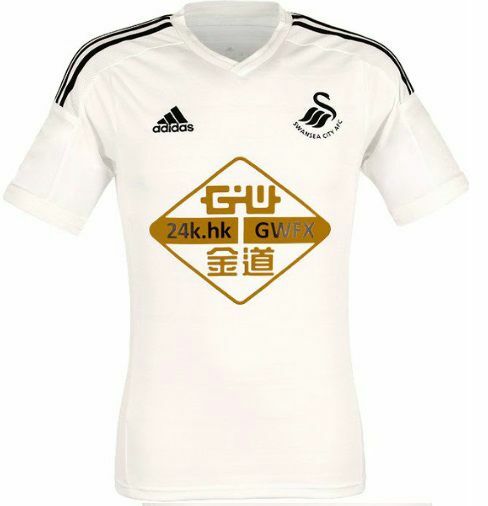 While the away kit will be in pink/white colour way. Above pictures are the leaked images of Chelsea home and away kits to be used in 2014-15 season. These kits will be released in July after the world cup. Tottenham Away kit has been released which is designed by Under Armour and it will be released at the end of the season, while home kit will come out just before the start of 2014-15 season. Psg home kit for 2014-15 season comes in traditional colours with vertical stripes, while away kit will be all white and Champions League alternative kit is in red colour. Allegedly these are the new warrior liveprool home away and third kits for 2014-15 season which will be released before Liverpool start their pre season in the summer 2014. The home kit is officialy released while the away kit will be white and the third kit will come in all black colour design. take a look at the below pictures. These are the leaked images of Warrior Porto Kits for next season, the home kit comes in traditional design, while Warrior did massive experiments with away and third pink kit. 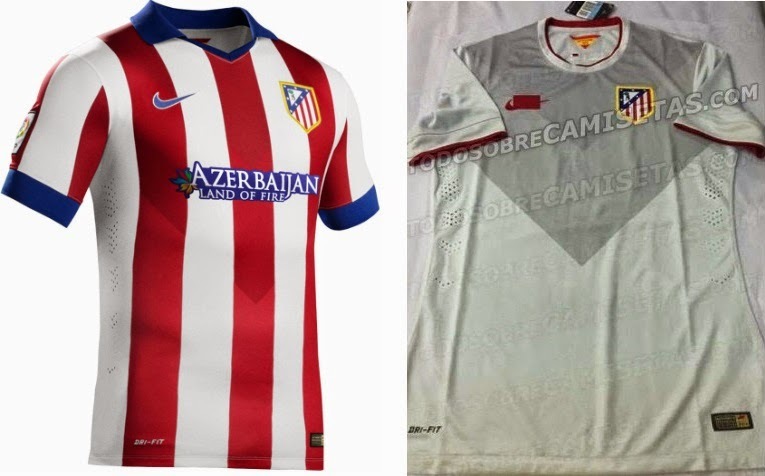 Here are the new home and away kits for spanish club Atletico Madrid which has been leaked online, the home kit is pretty much in traditional design while the away kit comes in unique desing. 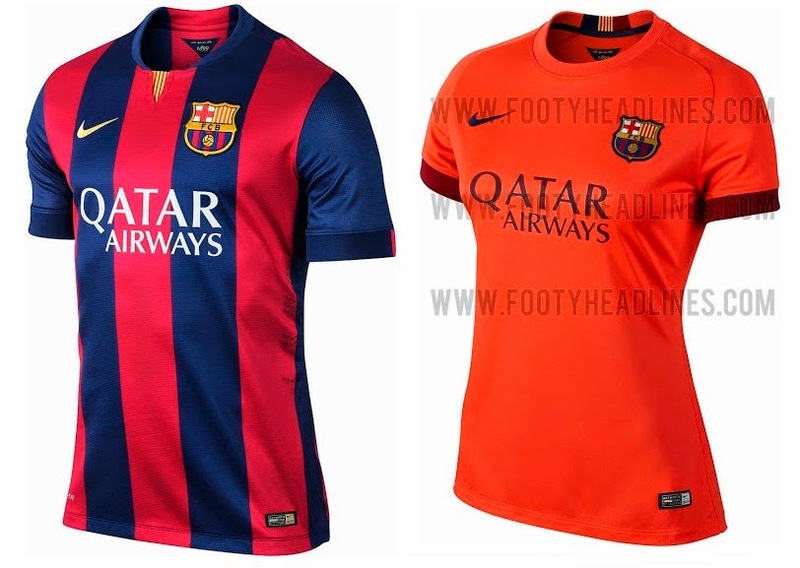 Following are the FC Barcelona 2015 kits leaked in spanish media. They are draft of what could be new Barca kits for ext season and will be released in July. Following are the leaked kit of AC Milan, with all of them getting a overhaul in design. The new kits will officialy release before the start of AC Milan pre season tour in July. Here are the new roma 2015 nike home and away leaked kits, release date is in july before the pre season starts. 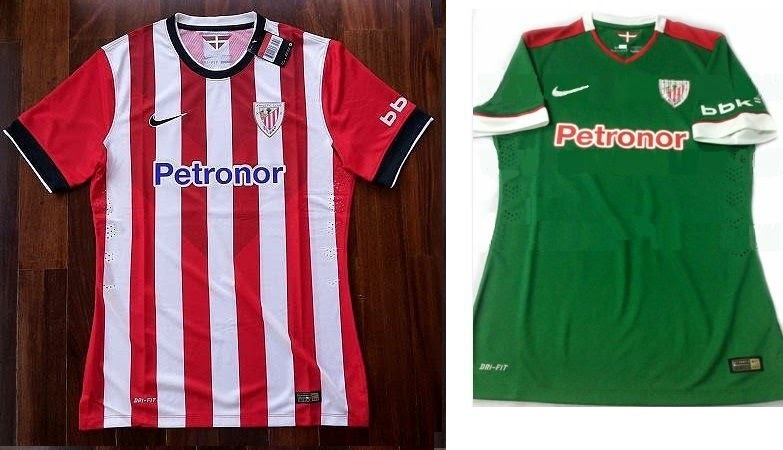 The new Bilbao kits for 2014-15 season has been leaked, the home kit is traditinal vertical red and white while the away kit comes in green colour. 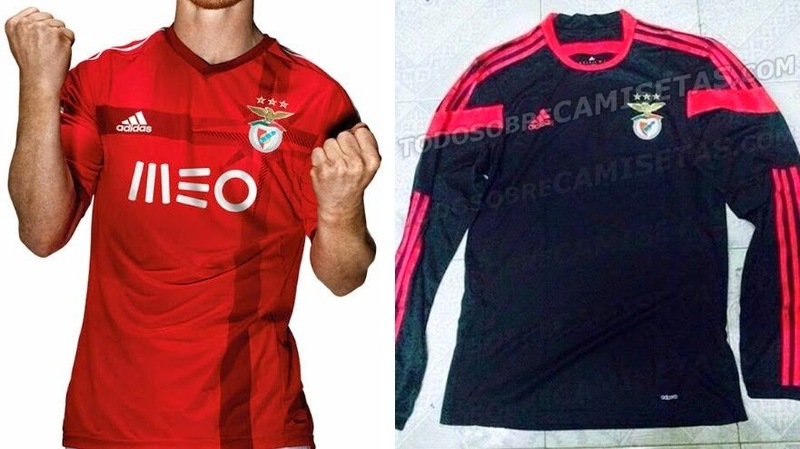 The new Benfica home kit comes in red colour with dark red application while away kit comes in black with red application. The home kit is tradional red/white colour with polo style collar, away kit is unique in design with dark Blue/striking yellow colour with round collar. 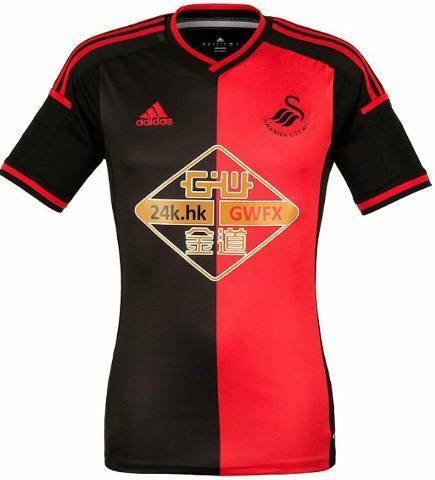 The home kit comes in all whtie with black application while away kit has red and black colour combination. Official home kit for 2014-15 season has been released while away and third kits are leaked. 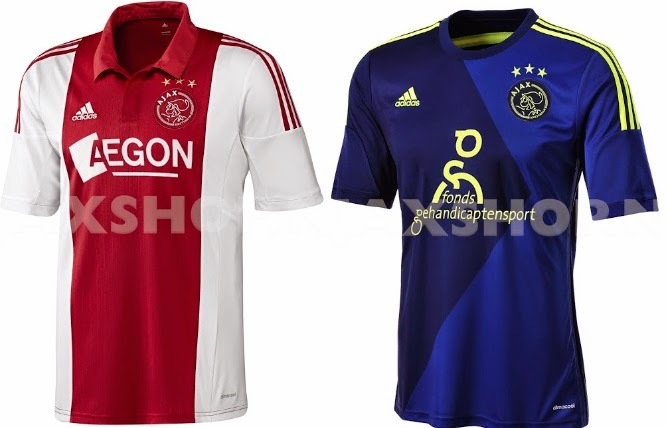 below are the pictures of all kits.